In Belur: To reach Belur from Chennarayapatna bus stand you can either take a direct bus or you can go to Hassan first and from there you will get buses to Belur. I got one to Hassan at 3.12pm, and reached there around 4.22pm (KSRTC charge is 27 Rs). From here I got another bus to Chikmangalore (which will touch Belur) and reached Belur at 5.38 pm (Bus charge is 27 Rs). 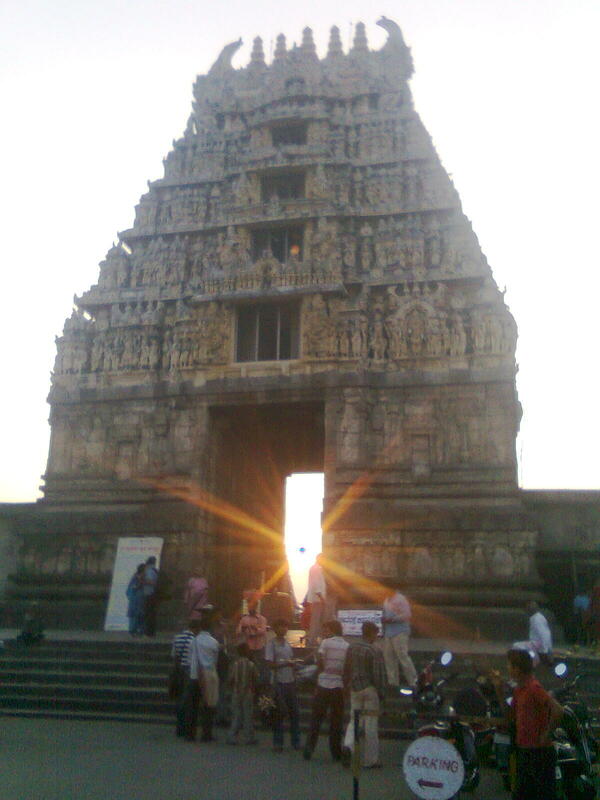 Chennakesava (means Handsome Vishnu, dedicated to Lord Vijayanarayana) Temple is near to bus stand. 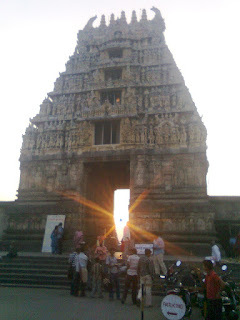 After getting down at Belur I started walking towards the temple, looking for some lodging on both sides. There are many hotels available including one KSTDC. I went to KSTDC first, but after seeing the building (It’s a good one but the rent may be very high), I simply walked backwards and checked the prices for other lodges. Finally settled in ‘Sumukha Residency' at the cost of 300Rs/day (For single room – not bad, this one even have one TV). I spend considerable time in the room by viewing English, one Hindi and one Malayalam movie at the same time. I saw the English movie fully, but missed the climax and some scenes in both Hindi (Red Alert) and Malayalam movie. Red Alert was indeed a good one and missing its climax left a bad taste in mind. It becomes late and temple was closed by the time reached there. As nothing else to do I roamed around for some time and went for a ‘Masala Dosa’ in the nearby hotel. Next day I reached the temple around 7.15am, but it opened at 7.30am only. Finally time came and I am inside – magnificent!!! Seems like Hoysalas done their best for the construction of the temple. In Chennakesava Temple complex, Chennakesava temple is the centre piece; surrounded by Kappe Chennigraya (built by Shantaladeve - Chief Queen of King Vishnuvardhana) temple. Temple complex also contains two more shrines, a pushkarni (stepped well) and dravidian style rayagopuram (built later by Vijayanagara kings). The construction of the temple was started by King Vishnuvardhana Raya to celebrate his victory over Cholas at Talekad (117CE) in the year 1116AD, continued by his son Narasimha Raya and completed by his grandson Veera Ballala. It took around 103 years to complete this 100 feet high architectural marvel. 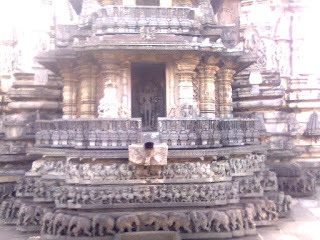 The outer and inner pillars of the temple are filled with numerous scenes from Indian mythology, elephants, lions, horses etc. Inner pillars are a must see for any person interested in architectural beauty. It is believed that Jakanachari carved many of these wonderful pieces. 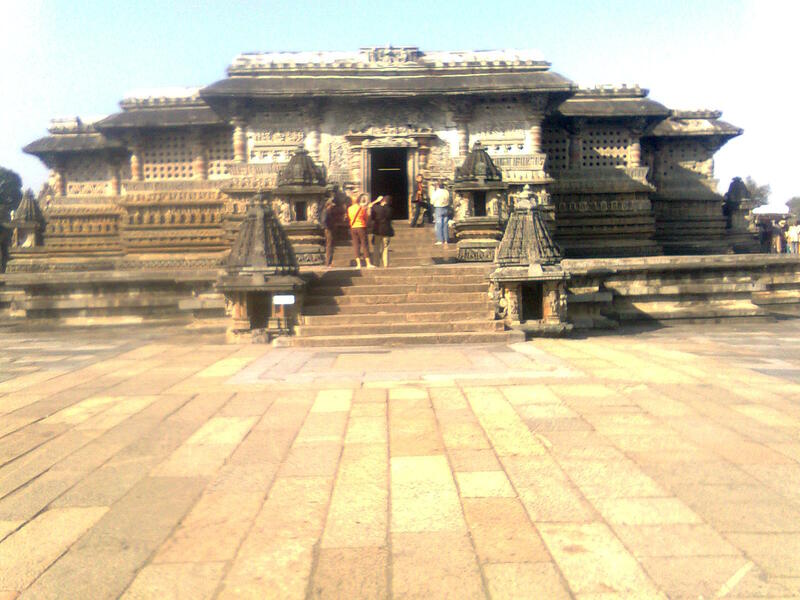 The temple of Belur were constructed using Soapstone (steatite) quarried from the present day Tumkur. 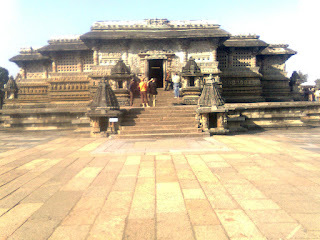 Belur structures are chemical washed and wax polished once in every ten years to maintain them. These temples are still active and Puja's are performed in morning and evening (a practice of more than 887 years).Temple complex also contain a 42 feet tall post know as 'Kartika Deepotsava Stambha' prepared and installed by Bice Dandanayaka (1414AD) during the reign of King Devaraya of Vijayanagara. You have to spend a lot of time to enjoy and understand this magnificent work of Hoysalas. They didn't left much space without any decorations - a must see for an enthusiast. After spending some hours in temple I went for breakfast and then to hotel. After checkout I went to Belur bus stand to catch the bus for my next destination - Halebidu.